A Devon prison has been praised for its education programme following an unannounced inspection. A report by the Chief Inspector of Prisons says Channings Wood near Newton Abbot has continued to improve. Anne Owers also says the jail has a safe environment with a very good standard of accommodation and good levels of purposeful activity. But the report also criticised the jail for not doing enough to help resettle inmates back into society. Ken Hawley, the acting governor of Channings Wood said: "We go through in detail at an early stage with the people exactly what they problem areas are, then we try to tailor them to different areas of training. "We do get a very positive response when people understand where they're going wrong in society." Despite releasing more than 30 prisoners a month, the chief inspector's report did highlight the lack of strategic direction in resettlement, overdue sentence plans and no visitors centre. 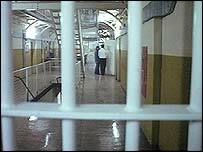 It also said that some shared cells were unacceptably small and prisoners should spend more time out of their cells. Channings Wood says it accepts the findings and says work is already under way to improve the resettlement of prisoners.